Showing results for tags 'nutty'. Celiac.com 11/03/2015 - If you like granola, but find store-bought versions too sweet, this home-made gluten-free granola is just the ticket. Ingredients: 2½ cups gluten-free rolled oats ½ cup raw almond meal ½ cup flax seed ½ cup pumpkin seeds ⅓ cup sesame seeds ½ cup blanched cashews, chopped ⅓ cup slivered almonds, loosely chopped ⅓ cup canola oil 4 tablespoons honey 4 tablespoons molasses ⅓ cup mixed dried fruit ⅓ cup raisins ⅓ cup dried coconut ¼ teaspoon kosher salt dash of cinnamon Directions: Heat oven to 300°F. Combine all dry ingredients in a large bowl and mix well. Add the canola oil, honey, and molasses in that order; this helps the honey and molasses pour more easily. Stir until well combined and all the dry ingredients are coated. Spread the granola on a baking sheet with a spatula Pack more tightly for granola with clusters Keep baking and stir every 10 minutes until the granola is golden brown—about 30–35 minutes. Remove the pan from the oven and stir in the dried fruit and raisins. Allow the granola to cool. Store in an airtight container for up to 2 weeks. Celiac.com 10/03/2013 - Having an easy apple crumble recipe in your arsenal is a good thing. This one is both easy to make and tasty as can be. I try to keep apples in the house, and find I usually have the other basics on hand, which can help to take the sting out of any dessert emergency. Ingredients: 8 tart apples, peeled, cored and sliced 4½ teaspoons fresh lemon juice ½ teaspoon vanilla 1 cup brown sugar ¼ cup granulated sugar ¼ teaspoon ground cinnamon ½ cup butter, room temperature ½ cup gluten-free oats (optional) ¾ cup crushed almonds ¾ cup almond meal 2½ tablespoons butter, room temperature (more as needed) Directions: Heat oven to 375°F. Mix almond meal and almonds, oats (if desired), brown sugar and a dash of cinnamon in a bowl. Cut in the butter. Use enough butter to so the mixture holds loosely together, but is not too moist. In a separate mixing bowl, combine apples, lemon juice, granulated sugar, vanilla, and of cinnamon. Toss to combine. Layer sliced apples in a 9 x 12-inch (or approximately the same size) baking pan. You can also use large ramekins. Sprinkle sugar mixture over apples. Bake 45 minutes or until the mixture is bubbling and apples are tender. Serve with fresh yogurt, whipped cream or vanilla ice cream. Celiac.com 09/03/2013 - Health food enthusiasts and gluten-free bakers are leaning towards a new flour alternative. Once scarce and requiring tedious home preparation, almond flour is peeled and ground to perfection, light, and readily available. Packaged in a devoted gluten-free facility, Bob’s Red Mill Almond Flour requires one ingredient: almonds. Minimally processed, with a natural hint of sweetness, consider it baker's gold. Gluten-free baked goods tend to lack an outstanding reputation regarding consistency. Using almond flour saves desserts from becoming sad piles of gritty disappointment. Individuals with a gluten and grain intolerance are enjoying better tasting baked goods with improved nutritional benefits. For these individuals, even gluten-free foods must be eliminated if the amount of carbohydrates elicit negative affects. One-fourth cup of organic brown rice flour contains 26-31 grams or carbohydrates and 3 grams of protein. This is nearly five times the amount of carbohydrates and half the amount of protein found in almond flour. Healthy baking alternatives are improving, increasingly becoming guilt-free without sacrificing good taste. However, almond flour’s lack of carbohydrates is made up for in cost. 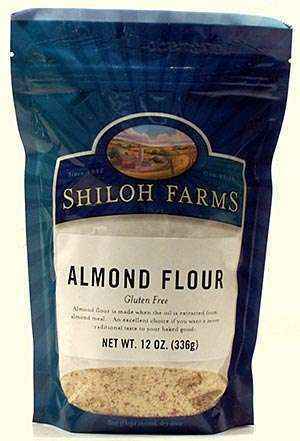 At thirteen dollars a pound, almond flour comes at a hefty price. Understandably, consumers discount the product for the sake of their grocery budget. Don't fret - almond flour incorporates perfectly and may be mixed with other flours. It is actually recommended to be used sparingly. Before raiding your cabinets and restocking the shelves, remember that almond flour should be used in moderation. To get an idea, one-fourth cup of almond flour is equivalent to eating twenty-three almonds in one sitting. This would be hard on anyone's system to digest. It's no secret that almonds contain many health benefits such as vitamin E, protein, and fiber. They are low on the glycemic index and versatile. However, they also contain polyunsaturated fats (omega 6) which promotes inflammatory causing agents. Polyunsaturated fat are not stable in withstanding heat and may become oxidized and toxic to body cells. Inflammatory. Toxic. Fats. Now, do not let these words send you running up in arms. As mentioned before: moderation is KEY and tends to decipher whether or not issues arise. Consider almond flour as the cherry on-top to a recipe that's already catered to your needs.